Mid-century modern architecture features simplicity and an integration with nature, intended to encourage people to explore the world in new ways. The houses, many of which are ranches or split levels, are currently in great demand, Realtors say. Mid-century modern madness abounds. Between 2007 and 2015, the AMC series Mad Men accelerated the interest in all things MCM. Tune in to HGTV to witness home buyers gush over wall-to-wall floor windows, open floor plans and horizontal stone. Magazines such as Atomic Ranch appeal to enthusiasts with articles such as Pink Tiles, Subtle Renovations and Soaring Rooflines; and Modernism Thrives with a New Generation of Purists. 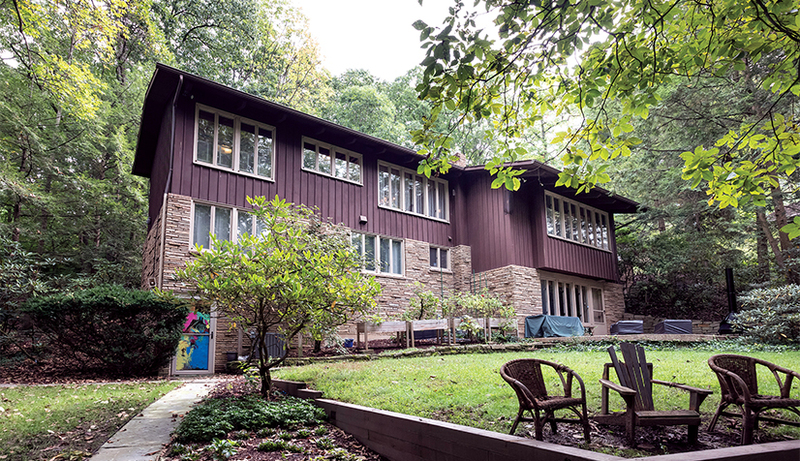 On woodsy Forest Glen Drive, two houses nestled near a small stream exemplified mid-century modern design long before Don Draper ever sipped a martini or lounged in a Herman Miller chair. In 1957, a young couple, Gretchen and Marshall Brown, hired architect William Polson Young to build a home in this location for their growing family. One year later, the architect Alexander Sansosti began construction next door for another young couple, Boyd and Ruth Challinor. Both houses are outstanding examples of one branch of the MCM design style that flourished between 1945 and the early 1960s. The term, mid-century modern, encompasses a variety of creative architectural innovations. 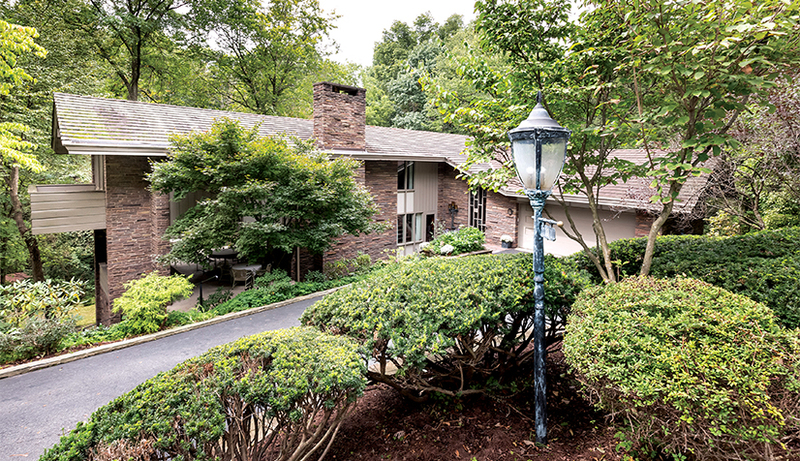 Cedarhurst Manor’s long, lean one-stories, split-levels and mid-levels are textbook examples of atomic ranches. The Brown and Challinor homes demonstrate a lingering connection to Frank Lloyd Wright’s organic architecture in the earlier decades of the 20th century. The Brown house and the Caroll house above, at right were designed by different architects but have the same flat planes, large glass windows and open space that characterize mid-century modern homes built from the mid-’50s to around 1980. The Brown house balances horizontal and vertical elements. 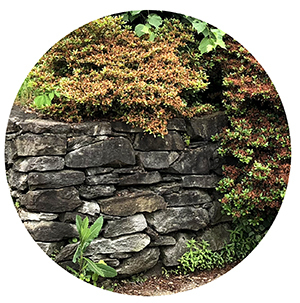 Random placement of the thin horizontal variegated Crab Orchard stone enlivens the entire exterior. The stone is balanced by vertical windows that flank the entryway. Five steps lead down to the door, introducing a tall thin window divided into vertical panes that echo the horizontal shapes of the exterior stones. Gretchen Brown, who still lives in the house, and her late husband raised six children—Michael, Leslie, Jennifer, Susan, David and Kelly—in this well-designed home. The living room flows into a dining room with a perfectly proportioned table for 12. A richly detailed cypress ceiling defines the space, as does the original grass cloth. The living room has a large wall of the horizontal Crab Orchard stone with a working fireplace. No mantle or unnecessary details distract from the drama of the eye-catching textured stone. The mid-century modern mantra calls for open floor plans for common living areas. In the Brown home, the dining room and living room flow together in a logical, comfortable manner. The integration of interior and exterior is part of the Frank Lloyd Wright canon, exemplified here by the long wall of windows and four doors along the back of the dining and living rooms that invite in natural light. The doors open to an elevated veranda that extends the length of the house and offers a view of the tranquil green glen. In 1973, the Browns seamlessly added a porch and a second-story bedroom with a balcony to the original footprint. Looking down through the glen to a swimming pool tucked among the trees, the cozy porch is a favorite gathering place for the extended Brown family. Frank Lloyd Wright believed bedrooms and bathrooms were secondary to the public living spaces. In the Brown house, the modestly sized bedrooms are on the second floor. The lowest level of the house is a spacious apartment-like area. The well-crafted original built-in walnut cabinets demonstrate the simplicity that makes mid-century modern both functional and timeless. The Brown family have plenty of room for furry family members in their home, flooded with natural light. As the Browns settled into their new home, next door Ruth and Boyd Challinor and architect, Alexander Sansosti were creating their own interpretation of mid-century modern. Three uneven levels of slate roofs shelter thin, rough-cut slabs of Maryland ledge rock that defines the horizontal exterior. Between the house and garage, a modest shaded breezeway provides private outdoor living space and entry to the house. Entering through the breezeway door seems quirky and understated, but inside the front door is a stunning visual surprise. Sansosti’s design compels the eye to sweep down the stairs to the expansive living room. A steeply pitched richly textured cedar notch and groove ceiling tops the expansive rock wall. The understated, off-center fireplace is functional but does not distract from the drama of the wall, which serves as the spine of the house, reaching down to the lower-level family room. The tactile stone defines the interior hallway, while on the exterior, the ledge rock melds into the chimney above the slate roofs. This spine is a classic example of how Wright integrated interior and exterior materials. Throughout the first floor, the rich tonalities of cedar ceilings and cherry walls are a counterpoint to the rough textured horizontal stone of the spine. Sansosti and the Challinors designed the house as a comfortable place to raise their daughters, Susan and Linda, but also to serve in the future. A comfortable sitting room and a master suite are just down the hall from the front door and the kitchen. In later years they were able to avoid three levels of stairs while still enjoying their home. After 53 years on Forest Glen, they moved, and spent the rest of their lives at Providence Point. 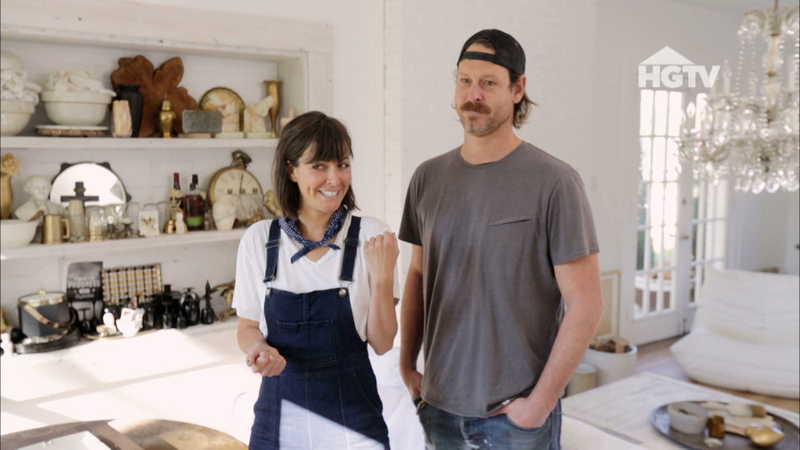 Synonyms for providence include: foresight, vision and discernment—words that characterize the sensibilities of Rob and Lacey Carroll, the current owners of the Challinor house. When they moved here from New York City in 2011, Lacey, who grew up in Mt. Lebanon, launched a search for a mid-century modern among the Tudors, Cape Cods and Foursquares that are abound here. Luck and timing led them down the driveway to 13 Forest Glen. 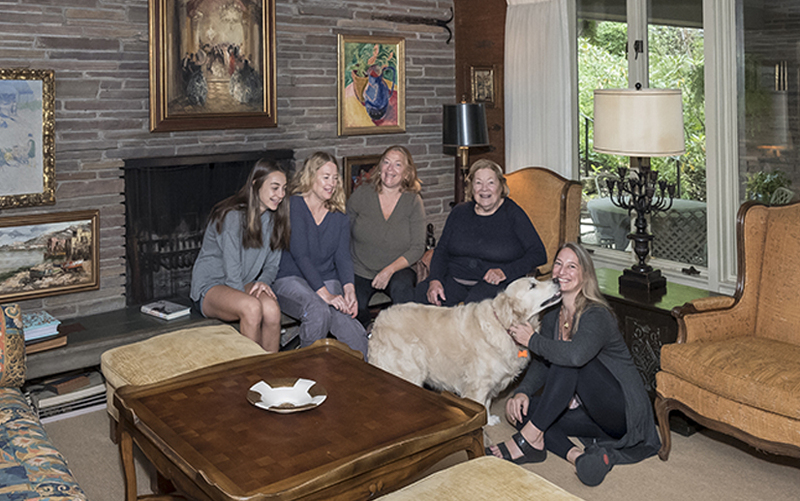 The Carrolls are “residence scholars,” knowledgeable about mid-century style and intent on preserving the history and important details of their house. The framed original Sansosti architectural rendering of the house hangs in the dining room. The original door knobs, recessed lighting, and grass cloth wall coverings appear as stylish as they were in 1958. In the kitchen, the couple added zinc countertops and a slate backsplash, and above the cabinets, colorful Hudson Bay stripes brighten the space under the cedar ceiling. Both Wright and Sansosti recognized that furnishings are architectural elements and integral parts of domestic design. In the Carrolls’ living room, the original long rectangular built-in bench sofa, a Fallingwater inspiration, runs below a band of windows and faces the striking stone wall. To compliment the rich wood in the room, the Carrolls favor minimal, structured teak furniture. In the dining room Sansosti installed a floor-to-ceiling built-in with a mirror inset. Lacey designed lighting to enhance the area. An open space in a dining room wall looks down into the living room, creating a stunning visual statement. One small detail exemplifies the Carrolls’ desire to preserve and protect what the Challinors treasured. Simple translucent, loosely woven cream colored curtains grace the windows in the dining room. The curtains have been in place since the 1950’s and are the perfect accent for a less-is-more sensibility. 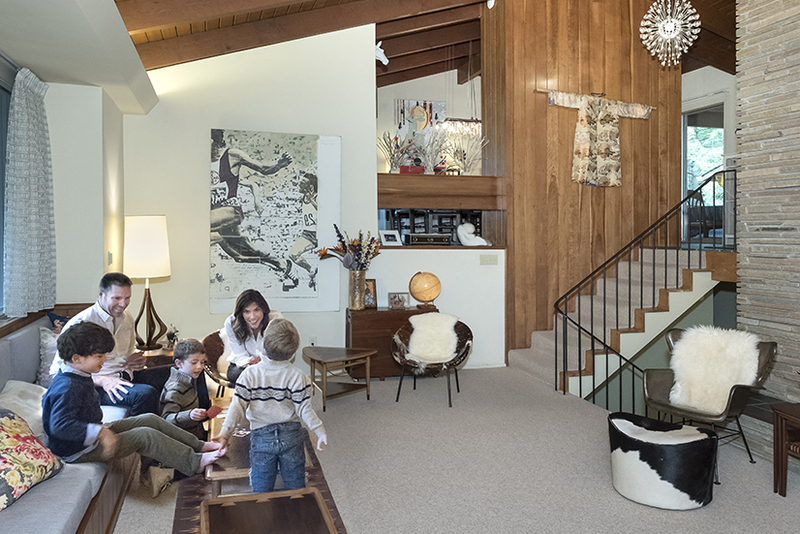 Gretchen Brown is content in her quintessential mid-century modern home. “I appreciate the functional space in my house and I never mind the overabundance of leaves,” she says, looking out the expansive windows. The Brown home brims with family activity, welcoming children, grandchildren and memories. The Carroll house, designed by Alexander Sansosti, was built by Dr. Boyd Challinor and his wife, Ruth. The Carroll and Brown offspring remember playing together in the glen when they were children. Leslie Brown Wagner, who recently moved back to Mt. Lebanon, remembers childhood adventures with the Challinor girls, and Linda Challinor reminisces about neighborhood games of night tag and sitting on the pillars at the end of the street waiting to welcome her father home. The revival of interest in mid-century modern is real. But in this tranquil corner of Mt. Lebanon there is continuity rather than revival. The “twins in the glen” are architectural delights whose fine features have been preserved, protected and appreciated for decades.